That is really neat! I was thinking about the swaddling clothes this week and wondering what the significance was. Thank you for the insight. Very interesting. Does the LXX match up with Luke in that regard? I think too much is being made of swaddling clothes. It was a common practice then and now and had nothing to do with being of humble origins. 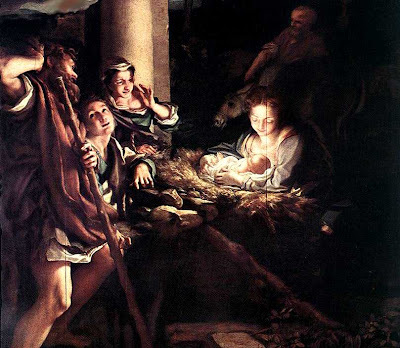 The point of mentioning swaddling clothes in regards to the passage about King David was to show that he began life as a baby, like all others, not that his beginning was humble since he had swaddling clothes. One tends to find what one looks for. I remember as a child in church being taught by a woman who had lived for a number of years in Israel. Her comment on swaddling clothes to us was that swaddling clothes or cloths were used to wrap the body of a person who had died. If this is true, the significance and message would be then that this baby, this Messiah, was born to die, something that would have been completely unexpected of the Messiah... if swaddling clothes were not ordinary baby blankets. I agree that the swaddling clothes are a significant part of the sign mentioned by the angel, but since swaddling clothes seem to have been common practice, then one should probably look for its significance in combination with "lying in a feeding trough", which seems much clearer to me as a sign, since no Jew would normally look for the newborn king in a feeding trough! The absolute clarity of the "swaddling clothes" part of the sign I find slightly elusive, even after all that the rest of you have said. What is clear to me is that it would absolutely have been a sign to the shepherds, and ultimately our realisation of that is what matters most. Ponder the questions? Why did the angels go to the shepherds first? Why are swaddling clothes twice mentioned, "And this shall be a sign unto you, ye shall find the babe wrapped in swaddling clothes, lying in a manger." The shepherds would take the firstborn of the flock for the sin sacrifice offering. To stop the newborn lamb from injuring itself so it would be without blemish they would wrap them in swaddling clothes and usually lay them in a manger until they were stronger ready to go to the mother. Thus the sign of the firstborn son wrapped in swaddling clothes lying in a manger was of special signifigance to the shepherds, who would share this incredible sign with others who could understand it! May He continue to have a significant place in everyone's heart especially on this day of celebration. I've never heard that before. Which sources from antiquity tell us the shepherds did this? Thank you Spec Blog, Anonymous and Bob for the helpful information. Your comments make clear the absolute necessity of us reading both Old and New Covenats, especially the Gospels, in their ancient Hebrew cultural context ...not a Western, especially English one. It seems from my research that the latter tradition up to the 18th Century was allegedly to assist an infant to be calm and grow straight. Luke esi mentions swaddling cloth not swaddling clothes. swaddling cloth, as I understand, was a very cheap cloth which was wrapped around the top portion of a reed, soaked in oil then lit. It would light the way as a torch. Jesus came to be the light of the world and came full of oil of the Holy Spirit. His light will always shine. Swaddling clothes/cloth are only used until the baby is able to turn over by itself, which happens around three months old. So the shepherds were given a rough age of the baby Jesus. I learned this summer that swaddling clothes were strips of cloth used to wrap the dead for burial. How often have we seen Lazarus portrayed coming from the tomb in strips of cloth? We were taught that the manger likely was in a cave where animals we kept and caves were also a place where burial cloth was kept. I'm hoping to get specific sources for this ASAP. But if this is so the irony should be apparent, Jesus was swaddled in the very thing He would later be buried in! This may explain also why when the entered the tomb they found the napkin folded but not the burial WRAPPINGS (plural). 7 And the napkin that had been about his head, not lying with the linen cloths, but apart, wrapped up into one place. 8 Then that other disciple also went in, who came first to the sepulchre: and he saw, and believed. OOOPS !!! checking further I may have overstated a detail: Verse 7 does not necessarily imply disorderliness of the linen cloths. As I look at it now the stress is on the napkin and the linen clothes being APART. Nevertheless the wrappings or linen clothes are plural. In a Bible study years ago we were discussing the significance of the grave clothes and the napkin laying separately. Our teacher who was well verse in Bible literature told us that in Jewish tradition that when the family was having a meal that if they were finished eating they would place their napkin in their plate and if they weren't they would place their napkin to the side to indicate that they would be back. Therefore it would appear that Jesus was not finished and that he will return. Just as he said he will. Swaddling clothes is the same material that was twisted and used for wicks in the oil lamps. Representing that Jesus is the light of the world! Micah 4:8 tells us of the announcement of the Messiah and that it will come to Migdal-Eder (Tower of the Flock). This is about 5 miles outside Bethlehem where shepherds would bind the newborn lambs used in the Temple sacrifice with strips of cloth (swaddling Cloths) and lie them in a manger so they would not get trampled, as they could not be blemished. I doubt this sign was lost on any of the shepherds who went to worship the Lord in Bethlehem. It doesn't seem to be known in the Gentile Church, but in Jewish tradition swaddling clothes were made from the priest's garments that were no longer being used. They were saved for royalty. Since Mary went to visit Elizabeth, and Zachariah being a priest, it is very possible that they gave swaddling clothes to Mary for Jesus' birth, knowing that He would be of the royal line of David, and Messiah. The place where Jesus was born was in the vicinity of where the lambs for the Temple sacrifice were raised. When the lambs were born they were wrapped in swaddling clothes to protect them so they would be without blemish. That model was there so the shepherds understand that the Messiah had been born. Hello Bob, just came from a pilgrimage to the Holy Land and our guide, a very passionate Palestinian Catholic who taught at a Catholic University in Bethlehem said the exact same thing about swaddling clothes and their significance to shepherds. The Scripture says "swaddling clotHs", not "swaddling clotHEs"(emphasis mine).